It’s not long before twenty-four of our talented students will leave for their first semester of high school in the USA, Canada, Great Britain, Australia and New Zealand. 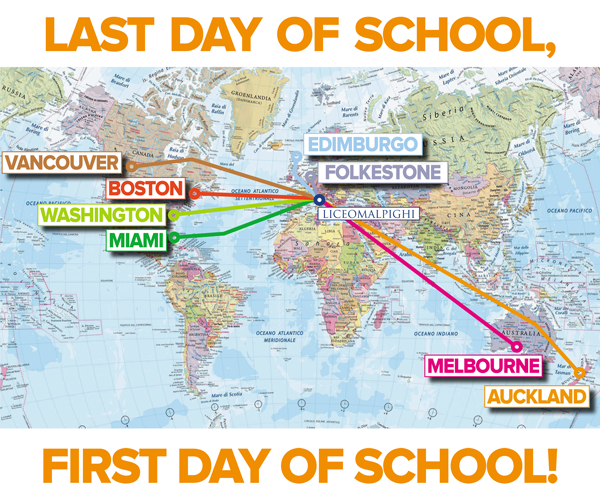 Each year, 20% of our 4th year students decide to study for 3-6 months at a partner high school from around the world. This unique opportunity will allow our students to share what they have learnt and their own cultural values in a different and exciting environment, as well as acquire and develop a new perspective about the world. So, our best wishes to: Benedetta, Diana, Giulia, Caterina, Federica, Ilaria, Giulia, Beatrice, Francesca, Maria Vittoria, Maria, Veronica, Maria Laura, Riccardo, Federico, Francesca, Matilde, Giulia, Rachele, Gabriele, Elisabetta, Riccardo, Giovanni and Eugenia!